I really like to mark this time of year to start new things and to clear out the old. I have spent my holiday doing just that. I spent a few hours cleaning out the magical craft closet, taking stock of what I have and what I want to work on this year. I have made the resolution to try a booth at a craft fair in the spring, and writing a list of projects that will get me to my goal. 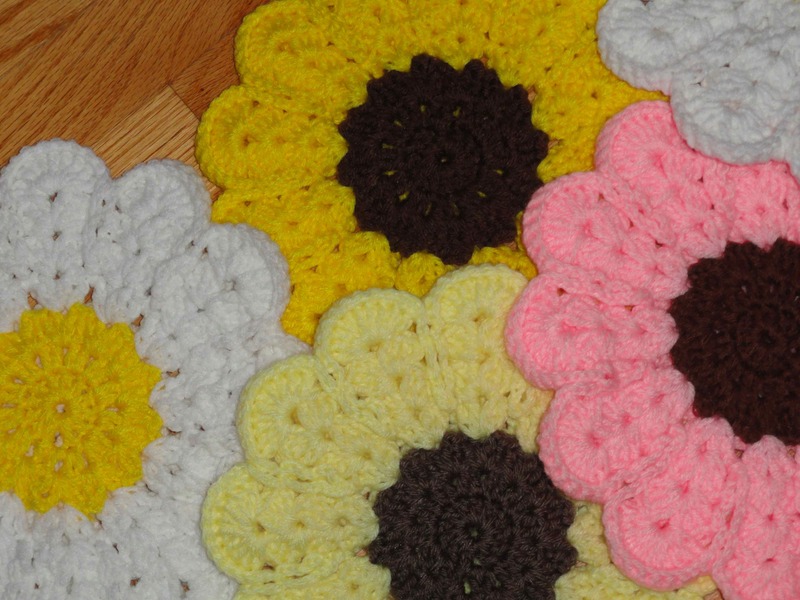 These flower power trivets are the first installment of the Great Spring Craft Quest. They make using up all the bits and pieces from my stash so cheerful. Although the crafty part of me has been on overdrive scheming patterns and ideas, the everyday part of me has had many other “out with the old, in with the new” projects going on as well. I have made the resolution to go more green again this year. I must up the ante in my home to be even more energy efficient, to make use of what I have: to reduce, reuse and recycle more than ever in the past. I spent 2 days on non-craft WIPs, you know those things that fill up the “to do” basket in the corner. So, I did more mending of clothing, fixing of tent poles, re-stringing of wind chimes, the cleaning out of the home office to go more paperless. AAHHH, sooooooo glad those things are complete and out of the way to bring in the freshness of the new year and the new ways of doing things in my home. I started on Thursday, a most odd day here, in the middle of winter we had 60 degree temps! As I cleaned up those projects and worked in our office (aka the “nightmare room”), the windows were open to get in some fresh air too! It really was amazing, but we knew we would pay a price for it…an ice storm followed the next day, and now the temps are not really making it above single digits. BBBBRRRR!!!! 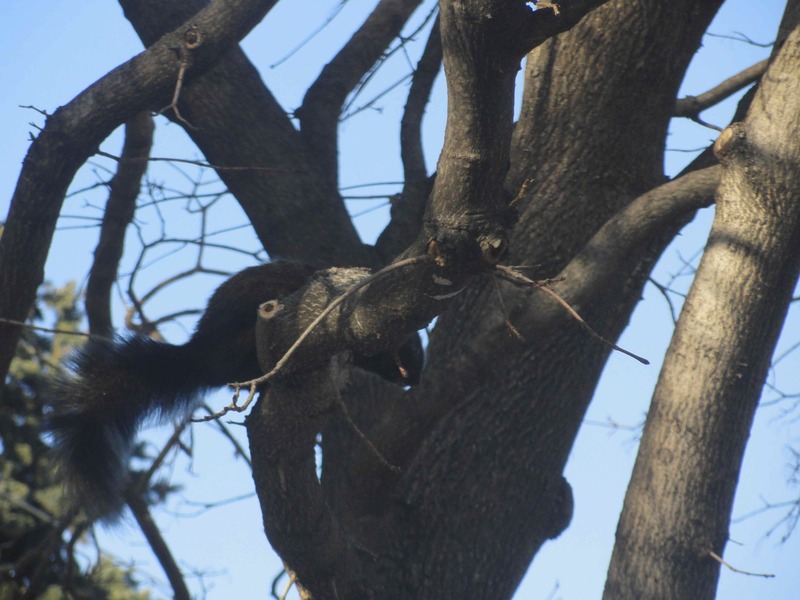 This little black squirrel made a ruckus by chasing the red squirrels out of my Mom’s yard today and I couldn’t resist catching his mug on film. Well, it is back to work for me…one vacation day left to get my New Year life in order! 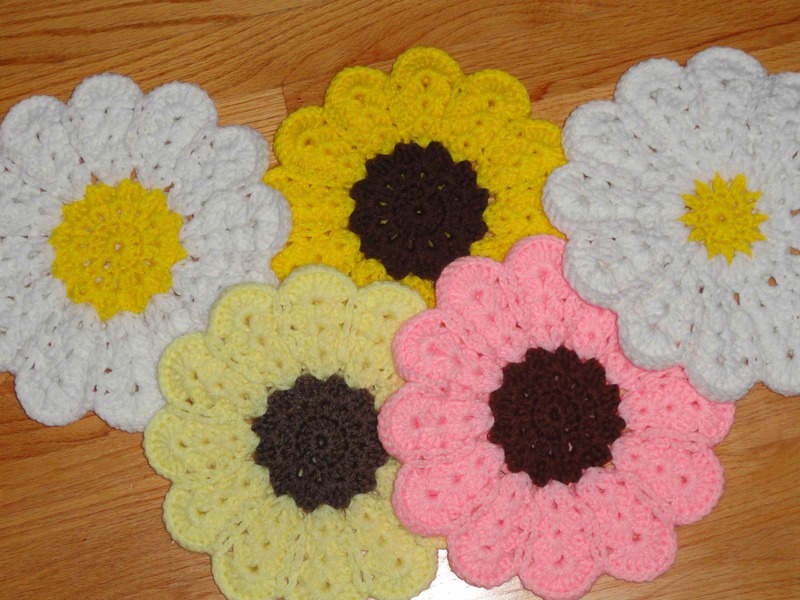 I love your flower power trivet but I can’t find the pattern for it. Could you send me the link? I was thinking of making them to put in between pans that are stacked. I hope this is the pattern you’re looking for but if not let me know. Has anyone found the pattern?